Becky (Bipes) Havelka, right, has purchased HP Insurance in Brownton from Bob Kreie. Her daughter Mackenzie Hopkins, left, is assisting her in the agency. 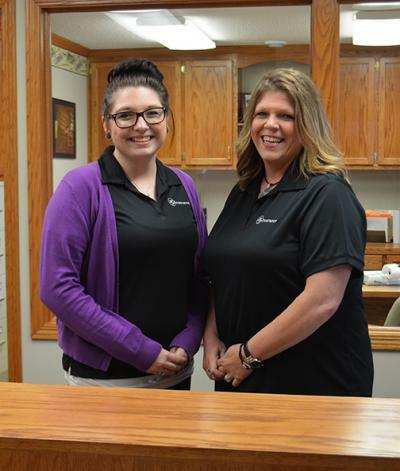 HP Insurance in Brownton has a new owner/agent as of April 1 — Brownton native Becky (Bipes) Havelka purchased the agency from long-time owner Bob Kreie. Kreie intends to assist Havelka during a transitional period, as does his assistant, Karla Wosmek. Mackenzie Hopkins, Havelka’s daughter, is her new assistant. Havelka is no stranger to the insurance business, although it was not where her original career path started. She had been working for a bank in Glencoe and had planned on taking a position with a chiropractor. As Havelka was leaving the bank on her last day of employment, she was approached by Terry Jones of Professional Insurance Providers in Glencoe and offered a position at its branch office in Excelsior. She earned her license in 2001. Along with working for Jones, Havelka has worked for State Farm and most recently at Buffalo Lake and New Auburn Mutual Insurance. While Havelka was happy in the insurance field, she didn’t ever really consider owning her own agency. “I really didn’t foresee it happening,” she said. Kreie told her in February that he was ready to sell. Although other agencies were under consideration as possible buyers, Kreie really wanted the agency to stay in Brownton — where it started — and have a local owner. Although Havelka was still hesitant — despite the fact that she had 100 percent support from her husband, Mike, and children Mackenzie and Blaine, as well as her dad, Larry Bipes — she took it under consideration. For more about the change in ownership, see the April 18 print edition of The Chronicle.